Mary Jemison has been the subject of several pageants in the Park over the years. 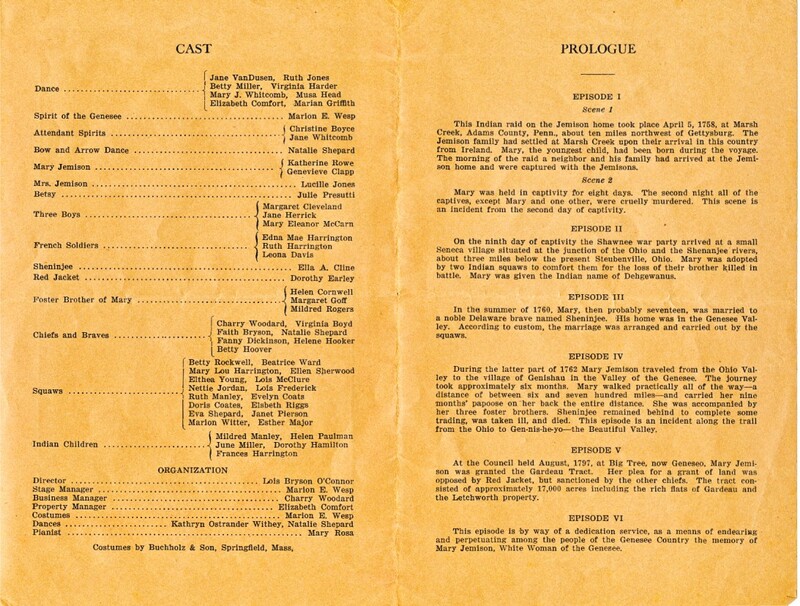 According to Katherine Barnes in her Rainbow's End, the Story of Letchworth Park pageants honoring "The White Woman of the Genesee" were held at Letchworth Park in 1927, 1929, 1932, 1954, and 1956-1959. The first two of these pageants was performed by members of "Camp Dehge-wanus", a girl's camp hosted during the summer by the Y.M.C.A. at Eggleston Park along the Genesee River in Allegany County. Members of the camp had first performed the pageant in 1926 at their camp. They held the pageant again in 1927, which Mrs. Barnes places in the Park, but according to contemporary newspaper accounts was held at Eggleston Park. There is no question, however, regarding the 1929 pageant. 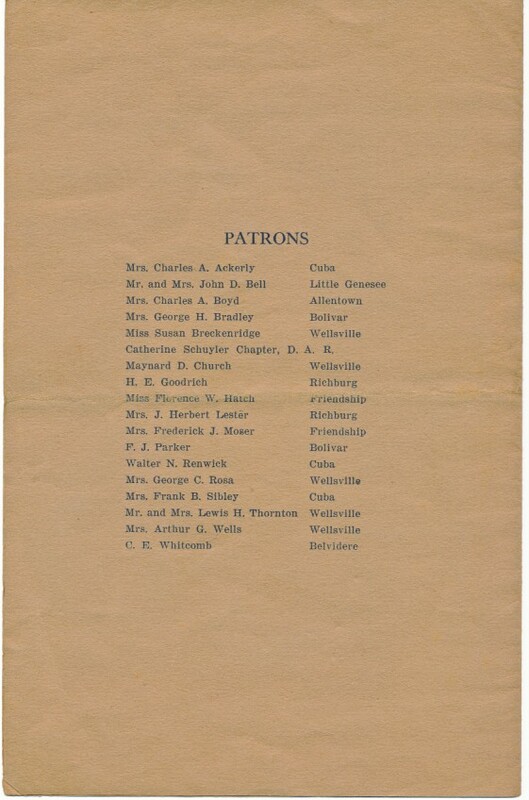 As the program below indicates, the event was held at Letchworth Park on August 8, 1929. The event was sponsored by New York State as part of the Sesquicentennial Commemoration of the Sullivan and Clinton Expedition of 1779. Although events in the Thirties were usually held on the Archery Field, acquired from the Denton Family in 1925, this pageant was held near the Glen Iris. One newspaper account reported that "amplifiers were used to carry the voice which mingled with the roar of the Middle Falls...."
Report of the Pageant found in "Scenic and Historic America", Bulletin of the American Scenic and Historic Preservation Society, September 1929. The Bolivar Breeze included an account of the successful program with an article on the front page of the weekly newspaper on August 15, 1929. 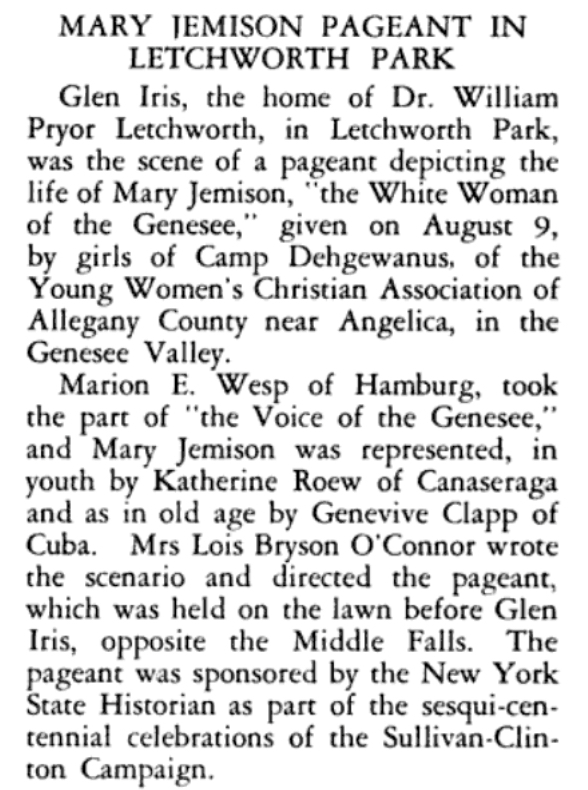 "Pageant Recalls Early Indian Days...Incident in Mary Jemison's Life Portrayed by 54 Camp Dehgewanus Girls...Letchworth State Park, burial place of Mary Jemison, ' first white woman of the Genesee' again echoes with the voices of colonial days Thursday, August 8, when 54 young women from Camp Dehgewanus, near Angelica, gave in pageantry form incidents from her life. In twilight hour, with its flickering shadows and the flow of the sun on the eastern gorge, upwards of 5,000 heard Marion E Wesp, Hamburg, as the voice of the Genesee, and saw Katherine Rowe, Canaseraga, and Genevieve Clapp, Cuba in the dual roles of Mary Jemison portraying her youth and old age.... The State of New York sponsored the pageant as a part of the sesqui-centennial celebration this year which will culminate in a major pageant at Leicester, September 14." The Leicester pageant dwarfed the Camp's production with an estimated 2000 participants and 20,000 to 40,000 in the audience. 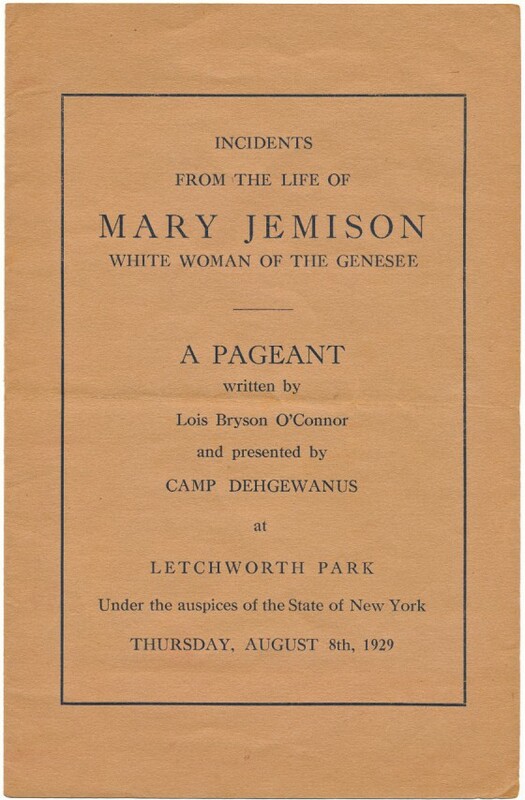 Although it was smaller, the Mary Jemison Pageant is important to Letchworth's history, for it helped establish the practice of having special public events in the Park, an important part of the modern day Letchworth Park experience.